And introducing CANDACE. Not just any babysitter—she's a Teen Genius, thankyouverymuch! What happens when four best friends find themselves splattered with mysterious purple goo during a routine sleepover? 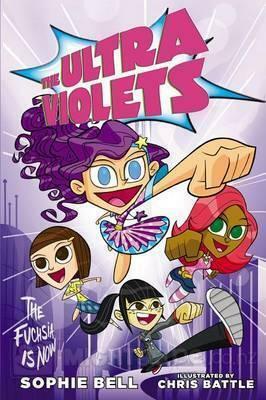 Iris, Cheri, Scarlet and Opaline are about to become…THE ULTRA-VIOLETS! "'Grape googly moogly,' Scarlet muttered, spotting the pastel bulldog. 'Iris, did you just color in Cheri's rent-a-puppy?' Opal murmured. Iris felt dizzy, even a little sick, like some invisible wave had knocked the breath out of her. But she was beginning to get the hang of this color-changing thing. 'Yes,' she whispered back, 'though I was trying for deep purple!'" This came out on March 5th and it is a fun read so far. I'll have my review up next Monday! ALSO!!! This is my 1,000 post! So that means contest time! Leave a comment below telling me what middle grade novel you would love to win and I will pick one lucky winner to get their book choice!